The East Coast was calling for a massive blizzard the other night with airports and roads closing preparing for the avalanche of snow, but Lotsa Laffs Photo Booths was out on the road heading to Pennian Bank’s annual Workers Appreciation dinner being held at the Millerstown Moose Lodge #925. State College was getting snow, but Millerstown was only receiving rain. The illusionist for the night had to cancel coming in since all flights on the East Coast were canceled. 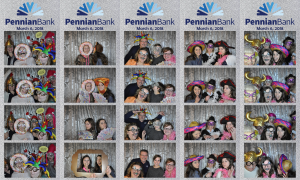 Scott E. Fritz, Pennian Bank’s President and CEO, was telling the employees that there would be no entertainment that night, but we quickly told the crowd that Lotsa Laffs Photo Booths will be the entertainment that night! Lotsa Laffs Photo Booths right away started to draw a crowd of people ready to have some fun behind the camera. Laughing, joking and photo bombing began to occur. Everyone was having such a great time. Four photos were taken by each group much fun in between each picture. Hats, boas, props, glasses and masks were quickly grabbed, placed on and replaced for the next picture. People forgot that a storm was brewing outside because they were having so much fun inside. The Moose Lodge had a spectacular dinner planned for the employees. The staff were on their toes keeping up with the hungry Pennian Bank employees, but others were having fun having so much mugging for the camera. Even after eating, people were lining up for pictures. Lotsa Laffs Photo Booths was having so much fun helping people find some awesome gear to put on before posing for the camera. As Scott Fritz began to distribute awards to his employees, he told everyone he would be brief so everyone can make it home in time before the storm hit. 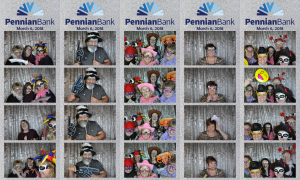 Lotsa Laffs Photo Booths was saying goodbye to the Pennian Bank employees as we quickly gathered our gear and readied to hit the road. They wished us a safe trip back to State College while we wished them a safe trip home that night. As we were heading back to State College, the temperatures tethered between 32 and 35 degrees Fahrenheit, but Lotsa Laffs Photo Booths made it back to State College without any difficulties. At the end of the night, we were huddled in our homes hoping the East Coast and especially the Pennian Bank employees were home showing off their photos to their family members. ← Lotsa Laffs Photo Booths At The State College Dairy Queen 10th Anniversary!